Like most people, you dream of winning a lottery. And why not? A single ticket to Powerball or Mega Millions costs between US$1 and US$3 only. Prize money runs into millions of Dollars. Lots of people have indeed won a few hundred millions by lottery. In fact millions of people worldwide believe winning a lottery is their only way to get rich, enjoy life, fulfill dreams and retire happily. Understandably, winning lottery and getting millions of Dollars can make your life happier. But there are flipsides of winning lottery too, a study by MIT Sloan Business School finds. Several lottery winners go broke and are likely to declare bankruptcy. In fact, life got worse for some lottery winners despite their unexpected and legit income from winnings. Several lottery winners wish they had never tried their luck, torn or lost their tickets due to woes they now face. The reason: These lottery winners did not know what to do with their money. As a result, they end up wasting their money and in most cases, without any source of income. Should you be an avid lottery player and win big money, it is possible to avoid going broke. Simply follow these steps and enjoy your new found wealth. There are countless stories about how people that won millions of Dollars went on dream holidays in foreign countries, bought expensive cars and homes. Nobody denies your right to enjoy the money you won from lottery. But here are some ways and means that can help you to better use the money and prevent going broke. The first thing to do if you win a lottery is calm down. Understandably, you would be extremely excited and elated at your good fortune. Visions of luxury will automatically emerge in your mind. A million thoughts about what to do with the money and how it will change your life will flood your head. In such scenario, the best thing to do if you win a lottery is calm down. Regain control over your thoughts. Remember, millions of people have lost their money spent buying lottery tickets while you have won. One in every 175 million Americans stand a chance to win lottery, says leading ticketing solutions provider, AXN, in its report. Once you calm down, thinking becomes clearer. You can process the win mentally and plan how to go about managing this large amount of money. Most people are unable to cope with stress when they get big money, which causes something called Sudden Wealth Syndrome– a stressful psychological condition. Instead, start thinking about what should be the next step in managing your winnings. Your winning lottery ticket is at great risk. There are countless instances where otherwise ordinary and honest people have stolen winning lottery tickets from coworkers, friends and even relatives. Who would not be lured by the thought of becoming an overnight millionaire? 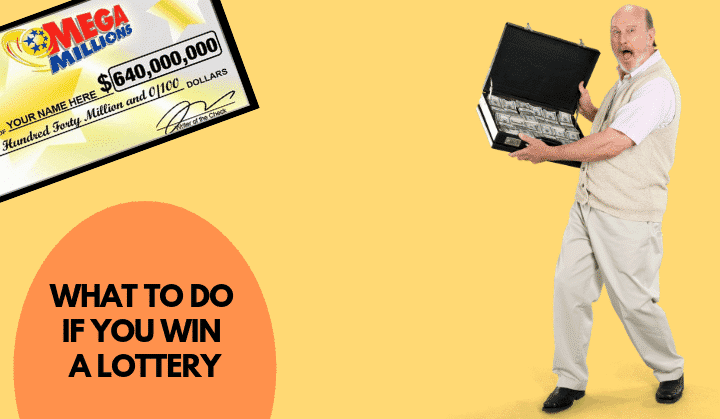 In fact, your very life could be at great risk if people know you carry a winning lottery ticket in your pocket or purse or keep it unguarded at home. The best way to safeguard your ticket is by keeping in a safe at your bank. Make scans and photocopies of your ticket. If you have a trusted attorney, keep the ticket with the law firm, sealed in an envelope. Always sign your lottery ticket and keep receipts and other proof of purchase handy. You may need them while claiming the prize or in the unfortunate event if your ticket gets stolen. Before you claim the prize money, get a good financial advisor or rather, Certified Financial Planner. Speak with them about the money you have won from lottery. Ask for the best ways to invest the money, save taxes and ensure the winnings last lifelong. Financial advisors come at a price. They will charge you some fee. This charge is definitely worth every cent if you want to avoid going broke despite winning millions of Dollars. Talk to the financial advisor about your life goals, how you plan to retire, fulfill your dreams with the lottery money and other ways you may have thought of to spend your winnings. A good financial advisor’s help will prove vital in claiming your money, saving taxes and investing for future. Usually, the lottery company will deduct around 25 percent taxes on your winnings directly. Check with your financial advisor if there are opportunities to reduce taxes and comply with Internal Revenue Service rules. If you win a lottery, the dilemma would be claiming your winnings as lumpsum or with annuities. The difference is considerable when you consider both pretax and post-tax amounts. This is where your Certified Financial Planner will come to the rescue. The call on whether to avail annuities or lumpsum is yours of course. However, most lottery winners and financial planners prefer lumpsum payouts. Single largest reason to opt for lumpsum payout is because it offers immediate flexibility to make the money work for you. Invested properly, returns can be much higher than what you would lose if you have taken the winnings as annuities. The worst thing to do if you win a lottery is quitting your job. There are couple of good reasons why you should continue working even though it involves long commutes and maintaining your routine. The main reason is, a lottery company will often take some time to declare you as winner, process the payment and send the money to your bank account. Should something go wrong about your winning after you have quit job, you might run into financial difficulties. Secondly, having gainful employment keeps your focus on more urgent things at work. Instead of thinking about what to do with the money and finding ways and means for splurging, you will be spending time on work. Also, leaving work for any reason is said to be a traumatic experience. This trauma combined with Sudden Wealth Syndrome can play havoc on your mental health. You can avoid these combined traumas by keeping your job. The best thing to do if you win a lottery is immediately pay off all credit, mortgages and loans. It improves your credit ratings and you need not worry about paying debtors on time. This saves you a lot of money. The amount you save may be little compared to the winnings, but the peace of mind by being debt-free is superb. Paying of debt and credit also has another benefit. You can afford to live without a regular income from job or work or business. Even if you invest all the lottery money and never want to work again, there is guarantee that debtors will never come knocking on your doors. If you win a lottery, relatives, friends and people known and unknown will pester you for small or large amounts of money. Understandably, giving money for some worthy cause or to someone very needy is justified. However, people that are well off can also come searching for free cash handouts. If you give money, chances are it is gone forever. If you do not, you may lose some relatives and friends. The best way to avoid this unwanted fallout of your good fortune is by relocating immediately. Move to another city where you are not known. Check out which are the best cities in the US to retire since they have excellent infrastructure and taxes are low. All of us want to donate for some worthy cause but never have sufficient money. You can donate some money for the cause that you always supported. Since you enjoy good fortune, why not spread it around? Giving also has beneficial effects on our mental, physical and spiritual health. It rids us of that looming feeling of helplessness when we see someone lesser fortunate like children with special needs or learning problems, elderly or the homeless. Investing wisely is a domain where your financial advisor will play a great role. Discuss your present needs and goals for life. Consider your retirement and the life you would like in those golden years. Ask your financial planner to draw a good investment plan. The more you invest, better the returns. Go for a portfolio that consists of various investment products such as bonds, stocks, annuities, savings plans, insurance policies and others. This ensures your money works for you and your future is secure- at least financially. And finally, go ahead and enjoy yourself. You have won the lottery and of course, you have a right to enjoy the good fortune. Go on that dream vacation abroad or buy a new car. Get a whole new wardrobe of designer garments and spend quality time with your loved ones. After all, what is the use of money unless you enjoy it? You have already paid taxes and invested it wisely. Your future and that of loved ones is now secure. It is therefore time to celebrate. But celebrate prudently, as the old adage goes. Resist that temptation to indulge in showy or boastful spending. For majority of people, winning a lottery is once-in-a-lifetime experience. Unless you are extremely lucky, you may never win another lottery again. The steps we highlight might help prevent some problems faced by lottery winners that wasted the money to go bankrupt. Your winnings should secure your future and also help enjoy life. Or you may end up wishing you had never ever bought a lottery ticket. If I win the lottery, I will start my own new home and treat my father and I will be happy with my mother. Dear sis What are the steps to get claim lottery money? Well said. Your guidance to the lottery winners is a wise advice to be followed. Even if we get small amount of money also we should be wise and follow the rules mentioned in the article. Thank you for publishing a good article. I wish i could win a lottery ….have always compromised dont want to compromise more…. Hello my dear a Togo person scamed me by such as lottory system,he has what’s app account and he mentions some directions he scamed me 88000 rs but not found my prize. Please give me suggestions for it. I like the Gyan I receive after reading this post, I haven’t win a lottery till date, but the advice I got from this post will definitely help me in future,not only with lottery 💰,but with other finances as well. yesterday I saw your interview on youtube that was awesome, you motivate the reader to stay and read the article in full, Am sure this website would help me a lot. Now am looking forward to contributing my hard work. I need capital for my business….. I do charity for orchid peoples.& Make my home. Some money invest & some to do business. & Most thing. Help helpless people. Becoz i dont want to big money. I have only some money to create my small life . I think all people find money a lot off. How get money a lot off. If I win a lottery, the dream that I have from my childhood is working with the poor and the poor because I myself came from the place. So I want to work on this day.